EV Group (EVG), a leading supplier of wafer bonding and lithography equipment for the MEMS, nanotechnology and semiconductor markets, and JOANNEUM RESEARCH (JR), a leading international research organization based in Graz, Austria, today announced that they are collaborating on a joint-solution for research and development activities in large-area nanoimprinting leveraging the EVG®770 automated UV-nanoimprint lithography (NIL) step-and-repeat system. 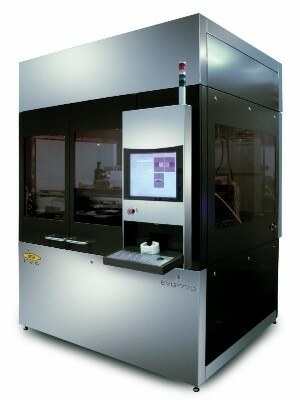 Specifically, the two organizations have adapted the EVG770 with new capabilities to accommodate foil substrates that will enable the EVG770 to be used at JR to manufacture flexible master templates applied in roll-to-roll NIL processing for photonics, functional surfaces and microfluidic device production. In UV-NIL processing, templates are used to imprint device patterns and structures onto a substrate, such as a wafer or a foil, which is coated with a UV-curable photoresist. "Nanoimprint lithography is an inherently lower-cost patterning process compared to other lithographic approaches and is ideally suited for certain high-volume production applications, particularly in the photonics and medical industries. However, the time and cost associated with manufacturing working stamps for roller-based NIL can still be significant, and this limits the flexibility that organizations have in conducting research to explore NIL's potential in these application areas," stated Dr. Ursula Palfinger, project leader at JOANNEUM RESEARCH MATERIALS. "EV Group's equipment and process expertise in NIL make them an ideal partner to realize the full potential of NIL and to bridge the gap in manufacturing large-scale master templates for roll-to-roll NIL out of original small-scale templates. The results of this work can have a profound impact on enabling greater process flexibility and further cost reductions in NIL processing." This research being conducted by JOANNEUM RESEARCH in cooperation with EVG involves the use of the innovative EVG770 NIL system to reproduce small pattern fields in a step-and-repeat fashion across a large-area substrate (up to 629 mm x 270 mm) in order to produce flexible large-area master stamps for use in roll-to-roll NIL processes. This first-of-its-kind approach to master template fabrication offers a cost-effective and high-throughput alternative to other approaches such as e-beam writing. In addition, the EVG770 NIL offers extremely-high resolution (sub-30 nm), overlay alignment accuracy and repeatability, which are essential for ensuring the production of high-quality master templates using a step-and-repeat NIL patterning process. JOANNEUM RESEARCH offers research pilot lines to serve its customers in implementing new innovations and products from idea to prototype, and to develop the necessary manufacturing methods. The pilot line for roll-to-roll micro and nanostructuring at JR MATERIALS Institute for Surface Technologies and Photonics in Weiz, Austria involves simulation, design and material development (polymers, coatings), and offers pattern fabrication and reproduction from mastering to roll-to-roll manufacturing and testing. The EVG770 NIL stepper with its unique capabilities concerning large flexible substrates and high alignment accuracy perfectly completes this pilot line in terms of scaling up master and working stamps for roller-based processes. "For more than 30 years, EV Group has developed innovative lithography solutions for micro- and nanoelectronics manufacturing. Our expertise and close collaborations with customers and industry partners has enabled us to extend the capabilities of our solutions to enable many exciting new applications," stated Dr. Thomas Glinsner, corporate technology director at EV Group. "This latest project with JOANNEUM RESEARCH allows us to demonstrate the ability of our benchmark EVG770 NIL stepper to provide a cost-efficient solution for larger-area mastering applications beyond wafer-size substrates. As a result, this can create exciting new opportunities for both EV Group and our customers." JOANNEUM RESEARCH Forschungsgesellschaft mbH is a leading international research organisation that develops solutions and technologies for businesses and industry covering a wide range of sectors. As an innovation company focused on applied research and technology development, it plays a key role in facilitating the transfer of technology and knowledge in Austria. More information about JOANNEUM RESEARCH is available at http://www.joanneum.at/.